You don’t need me to tell you soda isn’t healthy. It’s obvious. After all, soft drinks are full of sugar and other harmful additives. But a killer in a can? Yes, according to Harvard researchers. A shocking new Harvard study has revealed just how dangerous even a mild soda habit can be. According to researchers, just two sugary drinks a day could significantly shorten your life. And that revelation may put the final nail in soda’s coffin too. The massive study crunched data on over 100,000 men and women and spanned more than three decades. And what researchers found is bad news for soda lovers everywhere. Men who drank two or more sodas a day had a 29 percent higher risk of dying early than those who drank one or less a month. And for women, the news was even worse. Ladies who downed two or more sugary drinks a day had a terrifying 63 percent higher risk of early death. Plus, their risk of dying from breast cancer was 34 percent higher than the ladies who drank one or less a month. BOTH guys and gals were 31 percent more likely to die from heart disease and 18 percent more likely to die from cancer. And as you might guess, the more sodas folks gulped down, the higher their risks rose. The MAIN reason for that skyrocketing death risk is obvious. 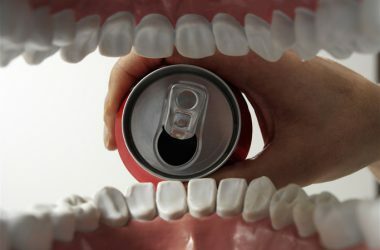 Because depending on your sugary drink of choice, you could be swallowing anywhere from 39 to 77 grams of sugar a can. And that can send your weight soaring and your risk for diabetes and heart disease right along with it. Thinking about making the switch to diet instead? Don’t. It’s bad news too. The Harvard researchers say women who drank more artificially sweetened beverages were STILL at risk for heart disease. And we know from earlier studies that there’s an association between diet sodas and diabetes too. In fact, the artificial sweeteners in diet drinks appear to be linked to metabolic syndrome a cluster of dangerous conditions including high blood pressure, elevated blood sugar, and unhealthy cholesterol levels. The bottom line? Sodas aren’t just bad for your health. And indulging in them too often could send you hurtling towards an early grave. If you’re still gulping down sodas or other sugary drinks, it’s time to make some changes, BEFORE it’s too late. I suggest going cold turkey. Switch to water with a squeeze of lemon or lime. Or, if you’re feeling fancy, you can opt for sparkling water with some frozen fruit slices tossed in. Black and green teas, hot or chilled, are great options too. Make TODAY the day you swear off death in a can FOREVER.